Depending on your outlook and preference, developing marketing content can be a fun task. It allows you to be creative while learning more about your business and industry. However, there is a demand to develop consistently-fresh content in order to engage your audience. Lack of fresh content may result in your audience looking elsewhere, resulting in a loss of your share in your marketplace. The constant need to come up with new and creative content can quickly burn you out and dim your excitement. We have a few tricks that to help you save time and make the content production cycle a little easier: repurpose content to give your audience a fresh perspective on your previously-published content. A lot of the content we produce has a long shelf life. This is where the term “evergreen” comes from. If you look back at your previously published content, you will probably find much of it is applicable to issues surrounding your business and industry today. Why? The pain points your customers face today are the same ones they’ve always faced. By repurposing your old content, you are giving your new audience a chance to show them how you can solve their problems without coming up with entirely new content. But there’s a catch: you don’t want to simply copy and paste old content and hit “publish.” It looks bad to the search engines, you may miss opportunities to update material, and you could fail to take advantage of a new marketing platform you were not previously utilizing. Edit and Revise To Correct Any Errors or To Reflect Changes in Business/Industry – As alluded to above, things change. If you want to republish a piece of content in the same format, take some time to edit it to make sure you correct any potential errors and to ensure everything is current with your business and industry. Convert to Different Format – This is probably the most common way to repurpose a piece of content. Take a blog and make it a video. Or take an infographic into a podcast. Or a video into an infographic. You can pretty much do anything (within reason of course). Republish On a Different Platform – If you choose to republish on a different marketing channel, then the choice of format is already made. For instance, if you are making a push to increase YouTube followers, you will focus on turning old content into videos. For Instagram, you may choose a combination of short videos and other visual content like infographics. Combine Content Around a Central Theme or Idea – If you publish content for a period of time, you most likely have created several pieces of content centered on a particular theme or idea. Repackage those pieces of content so they appear as one planned theme. Combine Posts into an eBook – This is taking the previous idea and putting it into one piece of content people can download. This is helpful if you are looking to collect email addresses to either build a larger email marketing list or for a specific marketing campaign. Create A Webinar – Take your content and create a presentation for a webinar. This is something you can do to further establish your expertise while educating your audience on how you can help them. Still wondering how you can repurpose your old content? 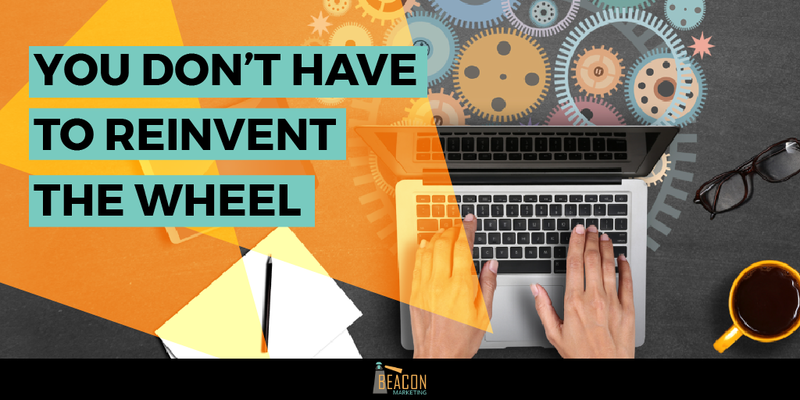 Let Beacon Marketing help you develop a plan to turn your previously used content into engaging material. Schedule a FREE 60 minute consultation today! When it comes to repurposing your previously-used content, the only limit is your imagination. Repurposing old content can help you re-engage previous customers, attract new ones, take advantage of new marketing channels, and open up new possibilities. The key is to review your content, compare what you have with your current goals, and select the pieces of content that will help you attract the customers you need to reach your goals. Doing so will inject some much-needed fun and creativity into your content-producing process.